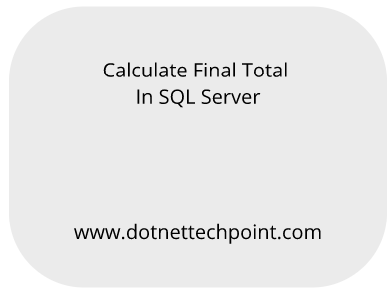 In this article we will learn how to Calculate Final Total In SQL Server. Now a day it is very tricky question asked by interviewer for experienced or fresher. Let’s start it with practically. Create a database. Now come on the point for Calculate Final Total. Question: What do you mean by Calculate Final Total? Answer: Calculate Final Total means sum all employee’s salary (Column) and show it in last row. Before implement this in Sql query we will know about ROLLUP. 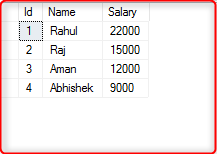 Answer: ROLLUP operator is used for calculate subtotal and grand total for specific column while it’s group data. It is used with group by clause. Note: If you use only ROLLUP then you will have to pass group by column name inside ROLLUP operator. Now implement this logic there are two methods in SQL Server for implement it, query for it. Note: When we use WITH ROLLUP then we will have to pass column name after group by and the use WITH ROLLUP. Conclusion: In this article we saw that how to Calculate Final Total in Sql server in easy way using ROLLUP and WITH ROLLUP Operator, but ROLLUP and WITH ROLLUP provide the same output.